Love both French onion soup and grilled cheese sandwiches? 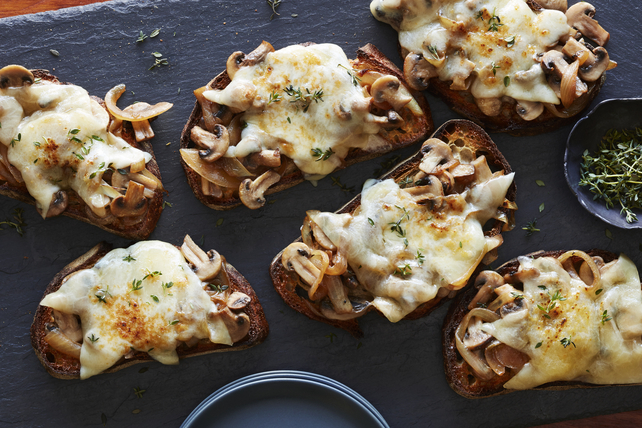 Then, our Caramelized Onion and Mushroom Cheese Melts recipe is for you! These tasty open-face sandwiches feature caramelized onions and melted cheddar cheese on crusty toasted French bread slices. Yum! Heat dressing in medium skillet on medium heat. Add onions; cover. Simmer on medium-low heat 15 min. or until onions are tender and lightly browned, stirring occasionally and adding water, 1 Tbsp. at a time, to skillet as needed to prevent onions from drying out and sticking to bottom of skillet. Add mushrooms; stir. Simmer 10 min. or until tender, stirring frequently. Remove from heat. Heat broiler. Place bread slices in single layer on foil-covered baking sheet. Broil, 6 inches from heat, 2 min. on each side or until lightly toasted on both sides. Top toast slices with onion mixture and cheese; broil 1 to 2 min. or until cheese is melted.